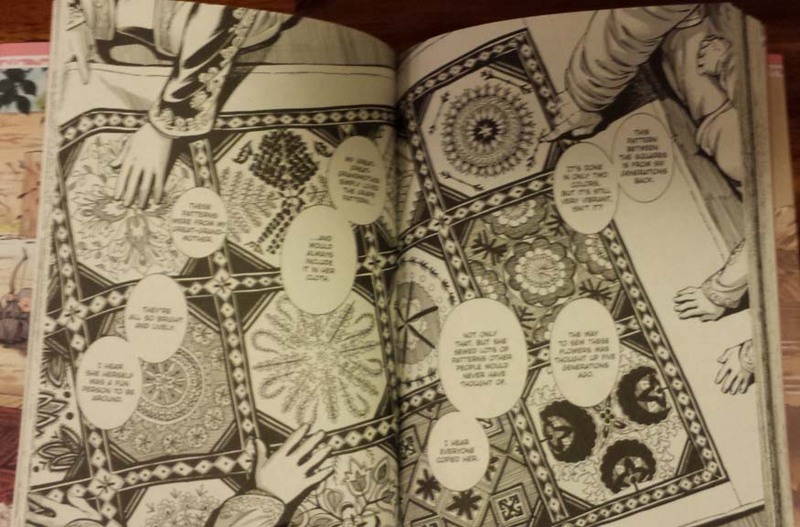 Andrea: Artwork wise, this is one of the most beautiful manga I have ever read, and the artwork really drew me in. I love how the author puts so much detail into the clothing and jewelry, and even into the backgrounds of the pictures. The only other manga I can think of that comes close to this level of artwork is XXXHolic by Clamp. Did you love the artwork as much as I did? Do you think A Bride’s Story would be as enjoyable to read if the artwork was just average? Michael: I also loved the artwork, who wouldn’t? I would mention Paradise Kiss as another excellent looking manga. I don’t want to take anything away from A Bride’s Story but without the excellent art it would be diminished a bit. Andrea: I just realized something that I should have noticed right away. Isn’t Amir a little old to be getting married? If she didn’t get married at fifteen or sixteen, does that mean something is wrong with her? Michael: Amir states in the book that her parents started looking for a groom for her when she was thirteen but took years to find the correct groom. Amir’s parents’ clan seems to be on the way down and they were trying to find a marriage alliance that would help them the most. The Eihon family. Pariya is the girl furthest to the right, with Amir standing next to her. Andrea: I want to talk about some of the other characters real quick. 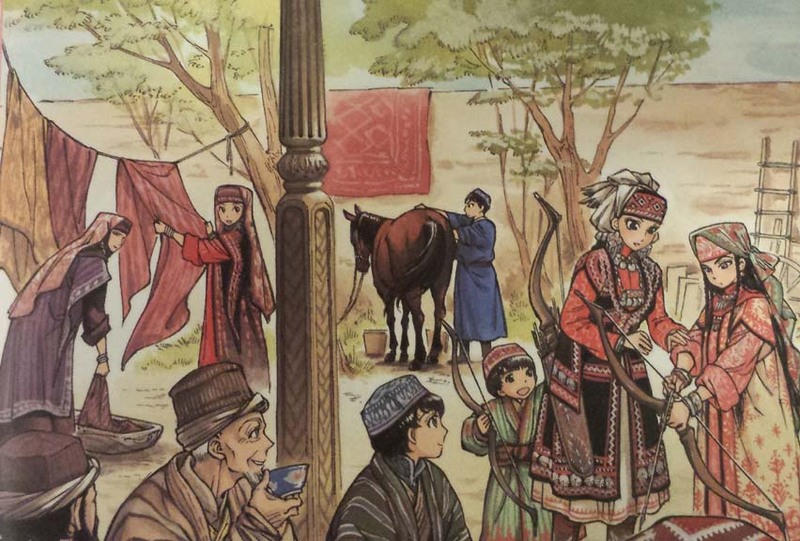 I liked the short side story about Amir’s nephew Rostem learning about wood carving (and the reader learning about how their houses were put together), and Pariya is the daughter of another family who knows she’ll have trouble finding a husband. What’s with the community ovens? And did you find Rostem’s little story, and Pariya as interesting as I did? What other side characters or scenes (if any) did you really like? Michael: I love the side stories! They are fun, and at the same time give us valuable insight into the lives f these people. I think that this is a text book example of show don’t tell. I enjoyed Tileke’s story as well, she is a young girl but her mother is trying to teach her to sew and embroider for here eventual wedding. Tileke embroiders dillegently, but the only thing she wish’s to embroider are hawks. These side stories are full of human warmth which I appreciate. Andrea: The embroidery was so beautiful! When Great Grandmother pulls out that piece that shows all the generations of embroidery styles of all the women of the clan, I just wanted to cry. Sure, my family has photos of weddings and such, but we don’t have anything like that, nothing that’s been passed down like that. And I can’t help myself: one more shout out to Rostem. He’s the youngest nephew, and his older brothers tease him a lot. But he’s learning the secrets of wood carving and architecture! I love how the side stories give so much more environment to Amir’s story, that this isn’t just about her, it’s about everything around her, that everything is connected. there are pages and pages of the most amazing drawings of even more amazing embroidery! Andrea: At first, I didn’t get why Amir freaked the hell out when Karluk gets sick. It’s just a little cold, he’ll be fine! But she seriously freaks out. And yes, he’s fine. But then I realized two things: Back then, people really did die from colds, AND, in fact some girls from Amir’s clan who married into a different family did get what was thought to be a common cold, and then died (actually, they died of something else, but that’s a spoiler!). 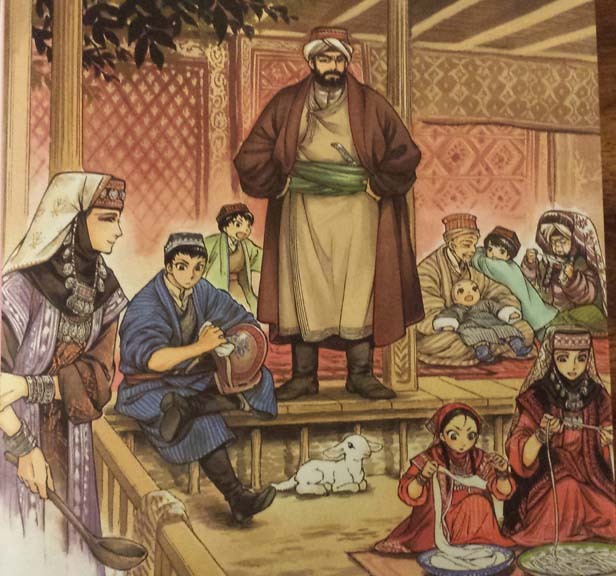 Since Amir and Karluk probably won’t have any children for at least a few more years, what would happen to her, and her standing in her new family, if Karluk were to die? Michael: We are so used to antibiotics and having no parasites that we have lost our fear of sickness. 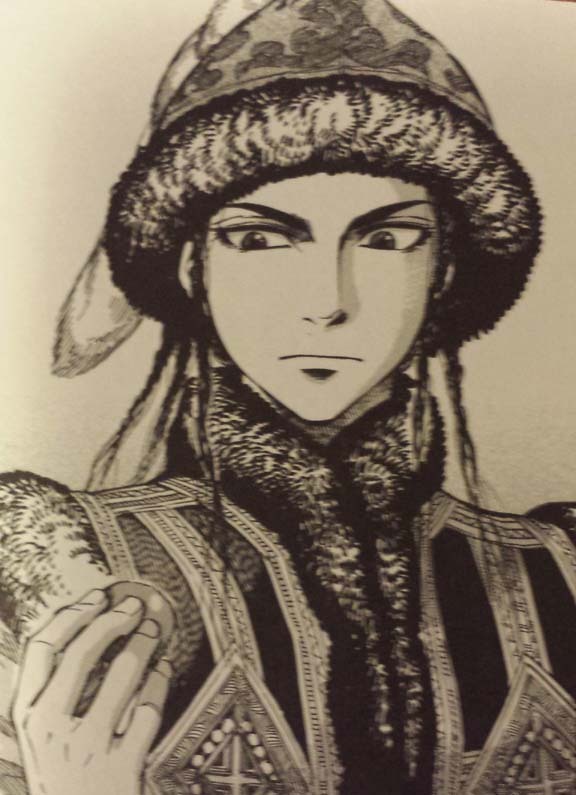 Amir would have to return to her family if Karluk died, and as she is already twenty her marriage prospects would be limited by time here parents found her another spouse. And spoilers! Andrea: Amir’s family tries to take her back. What the hell is up with that? And why is the skirmish between her family and the villagers so non-violent? Did the author just not want to show any violence in her story? Amir’s brother. He’s handsome, but he’s a jerk. And he’s not even the worst in her family. Michael: As I said earlier, we learn that Amir’s family are declining in wealth and influence and have a sudden opportunity for a marriage alliance with a powerful clan allied to the Russians. And they’re dicks. Anthropologists have studied East African cattle raiding in the 20th century and compared it to Central Asian small scale conflict and stories of Celtic cattle raiding in the past and found that these kind of family feuds rarely resulted in deaths. Andrea: So, what can I look forward to in future volumes? Michael: After volume two we follow the travels of our intrepid Englishman, Smith. He allows us to travel around the area and meet more people and more brides and potential brides. Andrea: Each volume has extras at the end, where the author, Kaoru Mori, gives some extra info. I think most manga have these extras “epilogue” type things. I wish American graphic novels had that too! Do you get as much a kick out of the extras I do? Michael: Yes, the extra’s are excellent. Reading these manga is an extra treat for me as I first read these in ‘Fellows’, a Japanese manga ‘zine which does not have all of these extras. Honestly, I am squeeing repeatedly at all of the extra chapters and extras I am getting. Kaoru Mori seems to use her extra space to answer reader questions, talk about her life, and give a bit of the lighter side of A Bride’s Story. 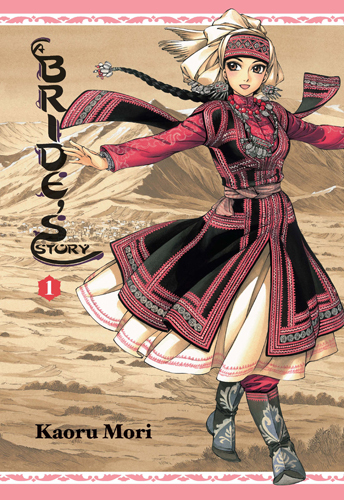 Andrea: Stay tuned for our discussions of future volumes of Kaoru Mori’s A Bride’s Story! 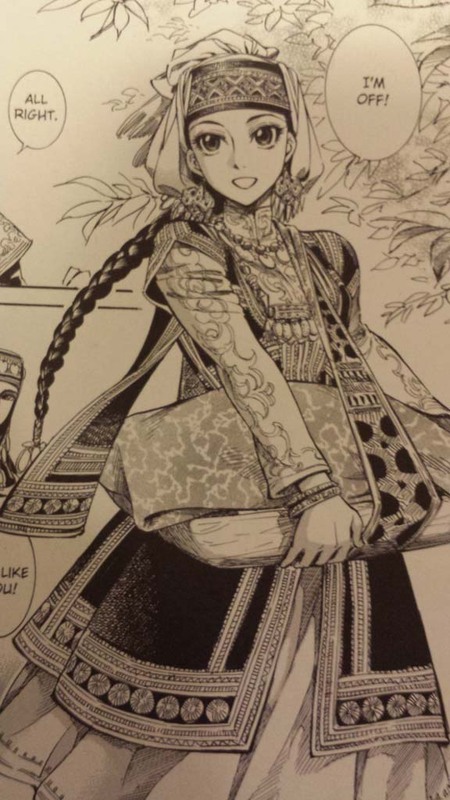 And if you’re interested in stories of the Silk Road, keep your eyes out for this manga title! 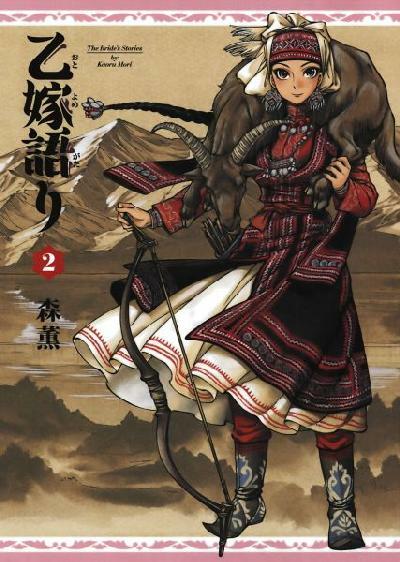 7 Responses to "A Bride’s Story, volumes 1 and 2 by Kaoru Mori"
I have just recently started getting into manga again. I am tempted to pick these up based strictly on the art style alone – the detail is amazing! These are fantastic, and the editions are just lovely. they are pretty easy to find too, I’ve seen them at Barnes and Noble and a few independent bookstores. Even better, if you aren’t sure what kind of story you’re looking for (adventure? coming of age? sports? magic? video games? ), you just want something nice to read, these are perfect, because it is this nice meandering historical fiction. Yes, I just checked BN online and they are hardcover edition! Next time I go there I’m going to give it read and it see how it is. I love that you’ve both collaborated again. It’s such a good idea and I love reading both opinions. The illustrations are lovely I have to admit. I really do appreciate good artwork. And, I think the different culture sounds so interesting to read about. I wait to see how this develops.